Presented By: Buffalo Bill Days Inc.
Golden will again be hosting its annual Buffalo Bill Days celebration. 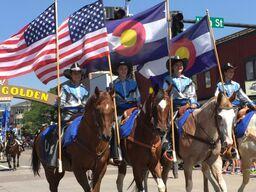 This event dates back to the 1940s as a trail ride up Lookout Mountain to Buffalo Bill's grave. The Buffalo Bill Days Committee has expanded the activities through the years and it is now the largest community festival held in Golden. The event draws many people from surrounding communities who enjoy bringing their families to a wholesome, small-town community event.